Outside Lands has made a name for itself as the one festival that uniquely presents music, food, wine, and art together in Golden Gate Park. One could say the festival perfectly captures the essence of San Francisco. And while the music isn't entirely local, the 33 food vendors draw from local catering companies, Bay Area street food trucks, and a slew of San Francisco restaurants. We thought we'd help narrow down the food options by highlighting some of the best SF restaurants at Outside Lands. You really can't go wrong with barbeque in the park. Maverick will be back for its third year at Outside Lands, serving up its signature Cincinnati BBQ Pork Sandwich, $10. Chef Scott Youkilis and owner Mike Pierce team up with Taste Catering every year to put on the massive production, which served up 1,000 pounds of pork last year. The juicy, tangy pulled pork sandwich is hands-down some of the best barbeque SF has to offer and is also available on the restaurant's brunch menu. Namu, a Korean-fusion restaurant in the Inner Richmond, will serve its play on the so-hot-right-now Korean taco. 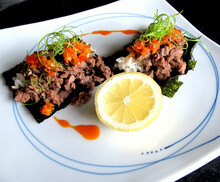 Think of the Namu Korean tacos as an open sushi roll with grilled short rib and daikon kimchi salsa. Kimchi can be an acquired taste, but it really works wonders in this dish. Chef Dennis Lee says he aims to maintain the level of intimacy that goes into all of the eatery’s food and he is proud to bring that to a larger crowd at Outside Lands. Christian Noto, chef/owner of Split Pea Seduction, will roast lamb and porchetta on a huge spit grill while rocking out to My Morning Jacket. Split Pea Seduction, a popular SOMA lunch spot, is known for its hearty sandwiches and Noto says he's bringing the best of the best to Outside Lands. A salad, two soups, and three sandwiches, all made from scratch, will be available at this booth. SPS’s velvety soups are known for always being precisely the right temperature, and they play the perfect sidekick to the artful sandwiches. 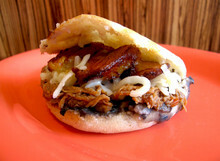 Venezuelan powerhouse, Pica Pica, will feature a fun mix-and-match menu with three signature breads and five fillings. Traditional cornmeal breads are wheat free, gluten free, and vegan. Try the Arepa Pabellon — crunchy, chewy bread with black bean paste, shredded skirt steak, cheese, and fried sweet plantains. If you're looking for a great breakfast option, go for the Ham & Cheese Maize'wich, a South American twist on a childhood favorite. The SF staple seafood restaurant, Pacific Catch, will be serving its famous Poke Bowls and Coconut Tempura Fish & Chips. Their buttery Alaskan True Cod is served with sweet potato fries and jalapeño tarter sauce. And for those with a healthier conscience, the Poke Bowl features lush chunks of Ahi tuna — a nice alternative to the heavier meats at Outside Lands. With stands at Justin Herman Plaza and the Warming Hut, Let's Be Frank knows how to serve up a great hot dog. The 100 percent grass-fed dogs, pork sausages and turkey dogs are juicy and packed with flavor. Try the original Frank Dog, $6, which comes with Devil Sauce and caramelized onions on a specially made Acme bun. Don't be afraid to ask for extra Devil Sauce — a homemade smokey jalapeño concoction that really takes these dogs to the next level. If you're not really the patient, line-waiting type, Little Skillet has you covered with a one-stop shop. They're serving up the whole shebang this year with Fried Chicken & Waffles, a side of creamy Tillamook Mac & Cheese, Bourbon Pecan Pie for dessert, and cold Strawberry Lemonade to wash it all down. We say go big or go home — order all of it and you'll be set for the day. You're definitely going to need some sugar and caffeine to get you through this festival. During the day, head over to Philz Coffee, where you'll also find Mission Minis cupcakes. Get Philz's signature black iced tea and Mission Minis' red velvet cupcake, or head over to the Mission Minis tent for all 10 lip-smacking flavors. 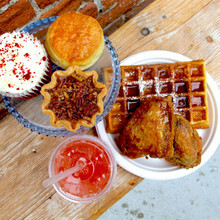 At $1 a cupcake, these two-bite delights will keep you coming back for more. When the sun goes down, warm up with a cup of Charles Chocolates' Hot Thai Iced Tea. Yes, that's hot Thai iced tea and it's one tasty oxymoron. Finish off your evening with Charles Chocolates' S'mores, a true festival favorite. The s'mores are made from scratch with organic graham crackers, house-blended bittersweet chocolate and perfectly toasted marshmallows.